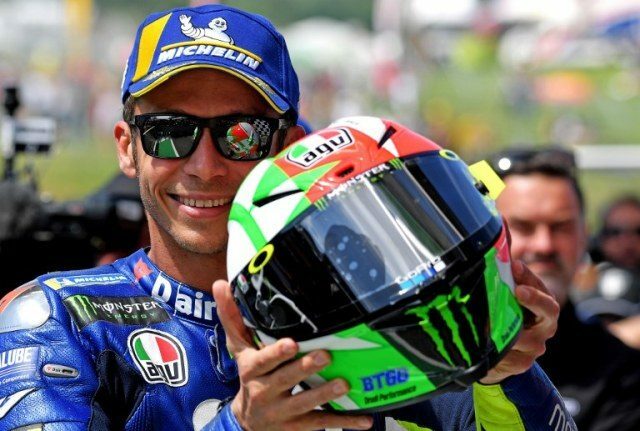 Veteran Valentino Rossi grabbed his first pole position in more than a year-and-a-half with a blistering pace giving him more records at his home track ahead of the Italian MotoGP on Saturday. He clocked a new best time of 1min 46.208sec around the lap to put him ahead of Ducati’s Jorge Lorenzo and Maverick Vinales. It will be the 55th pole position in MotoGP — 65 in all classes — for the former seven-time world MotoGP champion and first since the Japanese Grand Prix in October 2016. The Yamaha rider also became the first to start from pole position seven times at Mugello. “I’m very happy, it’s a surprise,” said the 39-year-old. “Starting on pole here at Mugello is always special, beautiful,” continued Rossi. Championship leader Marc Marquez will start in the second row from sixth on the grid with Italy’s Andrea Iannone alongside Danilo Petrucci in fourth and fifth position. “I’m very happy, finally a little bit of satisfaction,” said Lorenzo. “I have a good feeling, I am fast and steady. Vinales speed up to the front row after coming through the first qualifying round. “In the morning I had tried a more aggressive bike and instead I lost speed. For the qualifying we fixed things and it went well,” said the Spaniard. Italian Ducati rider Andrea Dovizioso, winner last year in Mugello, starts from the third row in seventh.